H x W: 15 in. / 30 in. Japan underwent a political, social, and industrial revolution in 1867. It quickly transformed from an isolationist feudal state to a capitalist, imperial world power. From 1867 through the turn of the century, the popular commercial art form of Japanese woodblock prints, called ukiyo-e, also underwent a rapid evolution. Where traditionally ukiyo-e depicted classical scenes of female beauties, kabuki actors, sumo wrestlers, folktales, travel, and landscapes, they became mobilized to illustrate news, events, and war. Depictions of war became popular among the Japanese, who were then involved in the Sino-Japanese and Russo-Japanese Wars. 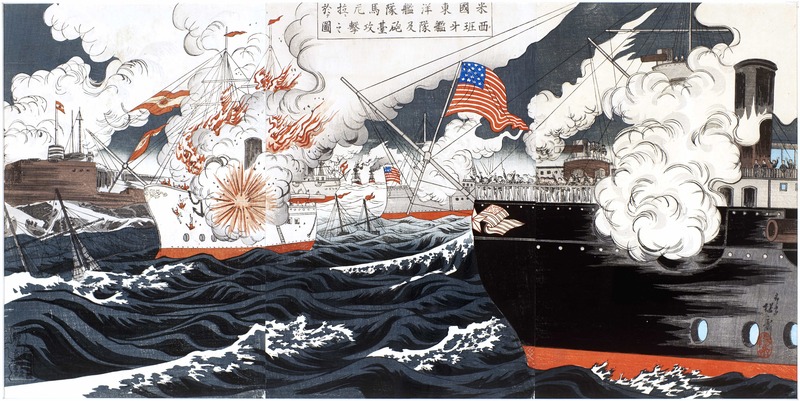 As evidenced by this print, major world news like the Spanish-American War also made its way into ukiyo-e prints. This scene depicts the Battle of Manila, May 1, 1898, and features the flagship USS Olympia under the command of Rear Admiral George Dewey.